Our morning began with a group expedition to Ankapark, an enormous amusement park under construction in central Ankara. The place looks and feels like a real-life game of Roller Coaster Tycoon, as it features an incredible seventeen production model coasters on a 180 acre ground that stretches over a mile from end to end. 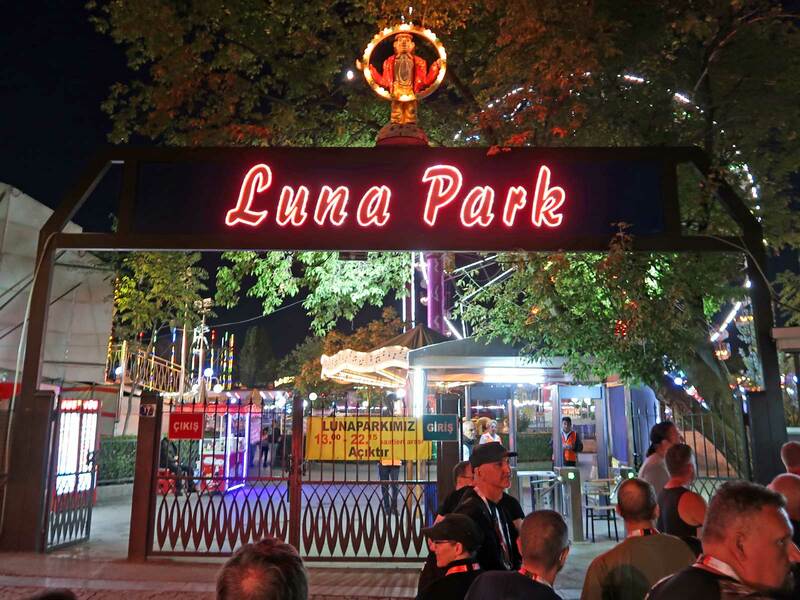 The business case for the park as it stands today is more than a little tenuous, given the number of staff that would be required to operate it, though in recent weeks a bidder has stepped up to the plate. The city mayor now claims that the park will open in 2019, and if that happens I'll do my best to get there on opening weekend. As expected we were unable to enter the grounds, though we did walk along the side of a main road to get a close up look at the park's largest coaster, a ten inversion coaster from Intamin. There was a sign visible through the fence saying Dev Roller Coester (their typo, not mine); with luck it'll be migrated over to Prod in due course. Our vantage point was too far to the west to see much else – most of the rides are at the eastern end of the site – though we did get a distant view of an Intamin flume and a Chinese copy of the Maurer AG Skywheel which I'm sure is a real thrill. Back in April I sent a note to Ben asking whether it might be possible to call in at a Wacky Worm manufacturer during the club Turkey trip. I introduced him to one of my Facebook contacts, an employee at Güven Lunapark, then promptly forgot that I'd done so. As such I was as surprised as everyone else when a visit to the factory was announced. It was interesting to learn that the family-owned business produces as many as fifteen coasters each year as well as a variety of other rides. 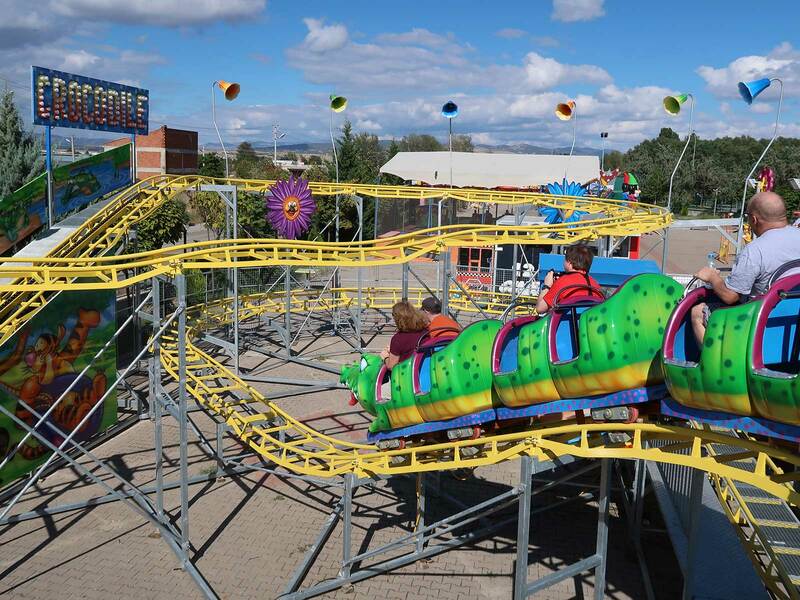 You can buy your own version for around €120,000; if I had a large enough garden I'd be heartily tempted to acquire one and sell tickets to enthusiasts on a pricing scale equivalent to their coaster count; it'd be paid off in no time! There was a mostly complete Sambaa Balloon ride set up in the factory, apparently destined for Dorinda and William Abbott in the United Kingdom, and the first step was for all of us to ride. Needless to say this was a lot of fun; Megan took the opportunity to pose in the operators cabin for a photograph. After disembarking we explored a number of workshops with ride pieces before ending up in a large shed where a finished Brucomela for the Portuguese market (named Mega Lagarta) was racked up on a trailer ready to go. Part of the base frame for another coaster was being assembled nearby, and were told that this were for a Dragon that would be available to customers in a few weeks time. The outline of a Ferris Wheel with a single partially assembled cabin was set up outside, and four lucky members got to experience one lap on it (at their own risk). Afterwards we trooped across the road to the small park owned by the company, where we all enjoyed a lap on the recently rebranded Crocodile (#2515). The figurehead on the train was a reminder that caterpillar trains are passé these days, and though copyrighted characters are a risk not everyone is willing to take there are many generic options available. Our third stop today was Göksu Park, home to the first alpine coaster in Turkey. Dağ Kizaği was manufactured by Wiegand in 2003, and it's fair to say that it isn't one of their finer efforts. The tracking is fine, but the terrain isn't steep enough for the sleds to pick up speed, resulting in an eminently forgettable ride. One of our group members forgot to brake at the end, and I can only conclude that she feel asleep while out on course. There was an unexpected bonus tick at the other side of the park in the guise of Sevimli Dragon, a triangular powered coaster with a commutator. Only three adults were permitted at a time, resulting in a lengthy queue of the sort only ever seen when coaster counting enthusiasts are in town. The operator was clearly bemused by our group, giving us some very questioning looks, but despite that he was more than happy to take our money. The club called by both 50 Year Park and Demetevler Luna Park, both of which were closed. The coaster at the former had been wrapped up for the season the day before, and we learned that it would be two hours work for a mechanic to open it, a non-starter. 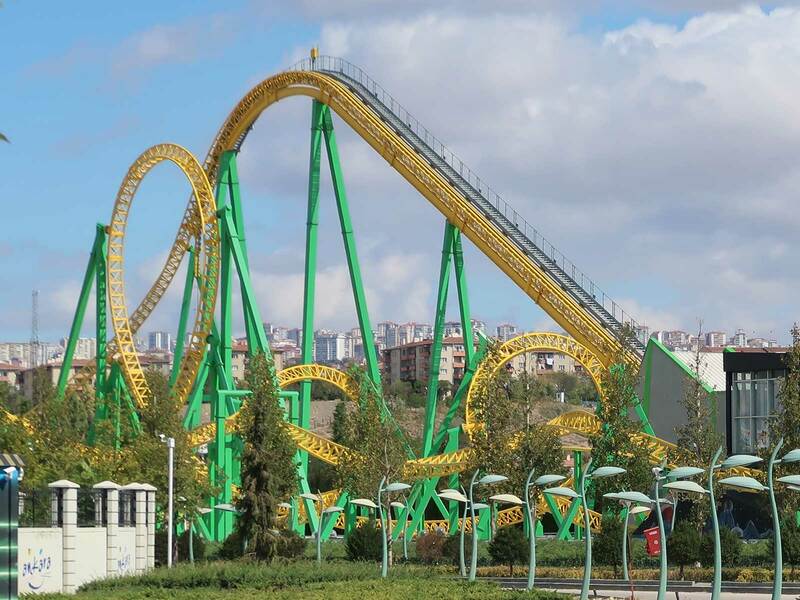 The one moment of levity was the realisation that we'd clocked up a new record for the number of closed coasters on a single day of a club trip, an incredible nineteen (or twenty if you include the one on the trailer at Güven Lunapark). One doubts that will ever be broken. Night had fallen by the time we arrived at Ankara Luna Park. It took some time to acquire enough credit for the three roller coasters we were expecting, which we initially put down to language issues. It was only afterwards that we realised that the powered Tornado Ren Expresi, a twin helix Zamperla Dragon, had been gone since the end of 2014. We also missed out on Tokaido, a Mack Blauer Enzian (also powered) that was in an area of the park that had closed for the season a week before. Fortunately the gravity coaster was fully operational, along with a decent selection of other attractions. Galaxi (#2516) is one of ten surviving examples of the venerable SDC Galaxi, and the only one that has ever operated in Asia. I was expecting an enjoyable if sedate ride, akin to the version I rode in August, but to my surprise this installation had a real kick to it, aided considerably by the lack of any braking. The helices were particularly forceful, and the bump at the end of the second helix delivered powerful airtime. The thrill wasn't quite to the level of the Interpark Cyclon at Borjomi Central Park, but it wasn't far off. We went back for two extra laps. Aside from the wheel our only other hit was Treno Fantasma, a three level dark ride with a spiral lift. Gloria asked me whether I'd be submitting it to RCDB, and while I'm not sure whether she was being serious or not the answer is an emphatic no; the descents between levels were fully controlled. There were a variety of different scenes separated by long periods of darkness; I spotted an ordinary looking adult male in a suit and tie, a large spider, a decomposing corpse in a coffin, someone being hanged, five separate paintings that changed to horrors as we passed (and reset before we moved on), and a random dog. The presentation was okay if not outstanding; I'd have preferred it if the speakers had been hidden from view.